In the past two months Lenco worked hard to put all pictures by Henk Adriaanse online. It’s a huge amount of bunkers which have been visited in a short time. In the meantime we’ve been working on the new website. It will be coded up-to-date which will lead to the biggest win: getting rid of the frames. It will be easier for us to update the website, easier for you because you can directly link to certain pages and it will be accessible across all browsers. The main template has been built but it will take another couple of weeks to finish it and start adding photos. For now take a look at www.bunkersite.com -> Updates for the big list on updates from the last two months including Gironde-Nord (La Coubre, Royan), La Rochelle (Île d’Oléron, Île de ré, and the festung La Rochelle), Nantes, Boulogne-sur-Mer, a very special Widerstandsnest at Goeree, Holland, and new pictures of the late war Pantherstellung in Holland. 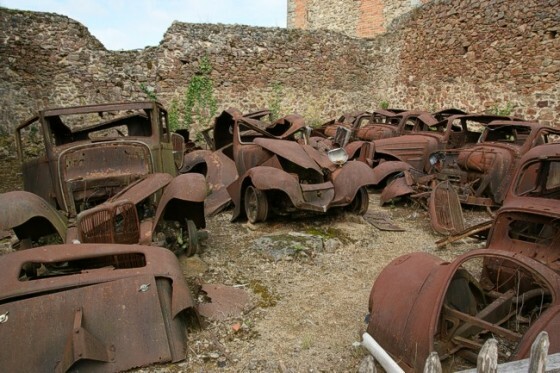 Last but not least we’ve made a side trip to Oradour-sur-Glane, a village that was massacred by troops of the Waffen-SS ‘Das Reich’ division.